Western blot analysis of HEK293 embryonic kidney cell line whole cell lysate probed with Mouse anti Human c-myc antibody (MCA2200) followed by HRP conjugated Goat anti Mouse IgG secondary antibody visualized using chemiluminescence. Alexa-FluorA647 conjugated Mouse anti Human c-myc antibody, clone 9E10 (MCA2200A647) used for the evaluation of c-myc on dicidual NK cells demonstrating the correlation between c-myc and CD122 expression. Expansion of specific iNKR subsets in decidual NK cells compared with matched pbNK. The expression of KIR2DL1, KIR2DL3/L2/S2, KIR3DL1, LILRB1, and NKG2A was examined by nine-color flow cytometry in matched pbNK and dNK from 21 donors. (A) Thirty-two distinct NK subsets were distinguished on the basis of the five iNKR in paired samples of pbNK and dNK (black and red graphs, respectively). The frequency of each subset from one representative donor is shown as a percentage of total NK cells. This provides a “fingerprint” of the iNKR repertoire, which is characteristic for each donor. The receptor combination for each subset is denoted by black-filled circles, with total number of iNKR in each subset indicated beneath. All NKG2A+ subsets are grouped to the right. The donor shown was genotyped as C1/C1. (B) The proportion of pbNK and dNK that express specific receptor combinations is shown as a percentage of total NK cells (mean ± SD, n = 21 matched pbNK and dNK pairs). The proportion of dNK that express two or more iNKR is significantly higher than in pbNK. (C) The percentage of dNK cells that are positive for Ki-67 was determined in each iNKR subset by intracellular staining. Control staining used isotype-matched mAb. The NK cells shown were gated on total KIR2DL1+ dNK as shown in Fig. 1A. (D) The percentages of dNK that are positive by intracellular staining for Ki-67 (•) and for CD122 (▴) are shown for all NKG2A+ dNK subsets (mean for each subset indicated by • or ▴ ± SD, derived from n = 11 donors). (E) Mean fluorescence intensity (MFI) of staining of each subset is shown following staining for CD122 and c-Myc in the NKG2A+ dNK subsets from (D). For each donor, MFI of each subset was expressed relative to the subset expressing NKG2A alone, which was set at 100%. Relative MFI of CD122 and c-Myc is highly correlated (Spearman rank correlation coefficient, R2 = 0.84, p <0.001). 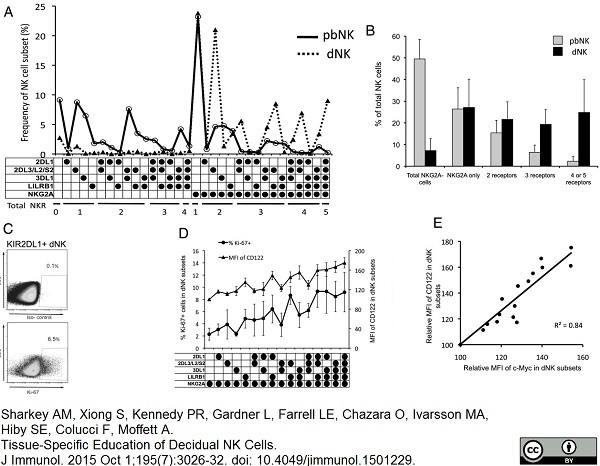 From: Sharkey AM, Xiong S, Kennedy PR, Gardner L, Farrell LE, Chazara O, Ivarsson MA, Hiby SE, Colucci F, Moffett A.
Tissue-Specific Education of Decidual NK Cells. J Immunol. 2015 Oct 1;195(7):3026-32. Topology determination of Chs3 using Proteinase K experiments with different myc-epitope tagged versions of Chs3. Cells expressing Chs313myc or different Chs33myc versions were converted into spheroplasts and treated with or without proteinase K in the presence or absence of Triton X-100. TCA precipitated proteins were solubilized and analyzed by sodium dodecyl sulfate polyacrylamide electrophoresis (SDS-PAGE) and Western blots using either: α-Chs3 or α-myc (A); and α-phosphofructokinase (PFK) (B) for immunostaining. Detection of PFK serves as a control for the integrity of the spheroplasts. Standard proteins are indicated with molecular masses given in kDa. 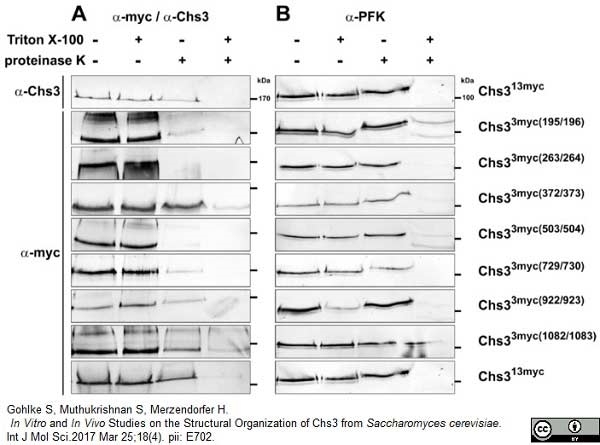 From: Gohlke S, Muthukrishnan S, Merzendorfer H.
In Vitro and In Vivo Studies on the Structural Organization of Chs3 from Saccharomyces cerevisiae. Int J Mol Sci. 2017 Mar 25;18(4). pii: E702. Mouse anti c-myc antibody, clone 9E10 detects the p62c-myc proto-oncogene protein, which is involved in the regulation of the cell cycle and cell growth. C-myc is primarily located to the cell nucleus, but has also been shown to localised to the cytoplasm in several cell lines (Craig et al. 1993). Overexpression of c-myc has been reported in a wide variety of human cancers (Nesbit et al. 1999). Mouse anti c-myc antibody, clone 9E10 recognizes the sequence EQKLISEEDL and may be used to detect proteins and peptides labelled with molecular tags containing this sequence (Hilpert et al. 2001). Synthetic peptide sequence corresponding to the C-terminal region (residues 408-439) of human c-myc conjugated to keyhole limpet hemocyanin. This product should be stored undiluted. Storage in frost-free freezers is not recommended. This product is photosensitive and should be protected from light. This product does not require protein digestion pre-treatment of paraffin sections prior to staining This product does not require antigen retrieval using heat treatment prior to staining of paraffin sections. Evan, G.I. et al. 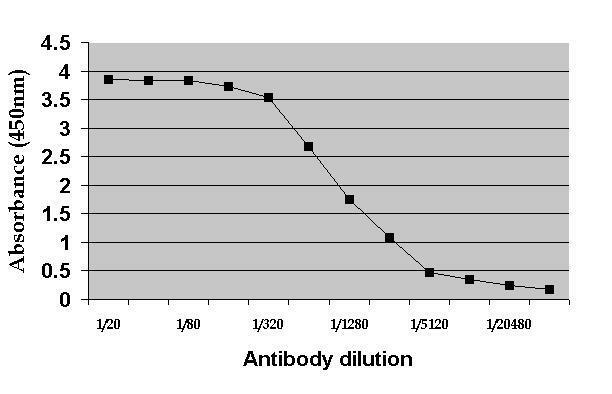 (1985) Isolation of monoclonal antibodies specific for human c-myc proto-oncogene product. Mol Cell Biol. 5 (12): 3610-6. Spandidos, D.A. et al. (1987) Elevated expression of the myc gene in human benign and malignant breast lesions compared to normal tissue. Anticancer Res. 7 (6): 1299-304. Borodina, I. et al. (2010) Display of wasp venom allergens on the cell surface of Saccharomyces cerevisiae. Microb Cell Fact. 9: 74. Groeger, G. et al. (2007) Co-operative Cdc42 and Rho signalling mediates ephrinB-triggered endothelial cell retraction. Head, B. et al. (2009) Inducible proteolytic inactivation of OPA1 mediated by the OMA1 protease in mammalian cells. J Cell Biol. 187: 959-66. Hilpert, K. et al. (2001) Anti-c-myc antibody 9E10: epitope key positions and variability characterized using peptide spot synthesis on cellulose. Krauss, N. et al. (2008) The structure of the anti-c-myc antibody 9E10 Fab fragment/epitope peptide complex reveals a novel binding mode dominated by the heavy chain hypervariable loops. Gray, P. et al. (2010) Identification of a novel human MD-2 splice variant that negatively regulates Lipopolysaccharide-induced TLR4 signaling. Duriseti, S. et al. (2010) Antagonistic anti-urokinase plasminogen activator receptor (uPAR) antibodies significantly inhibit uPAR-mediated cellular signaling and migration. J Biol Chem. 285: 26878-88. Tan, P.H. et al. (2005) Creation of tolerogenic human dendritic cells via intracellular CTLA4: a novel strategy with potential in clinical immunosuppression. Wallace, S.W. et al. (2010) Cdc42 regulates apical junction formation in human bronchial epithelial cells through PAK4 and Par6B. Mol Biol Cell. 21: 2996-3006. Rowshanravan, B. et al. (2014) RasGAP mediates neuronal survival in Drosophila through direct regulation of Rab5-dependent endocytosis. J Cell Sci. 127: 2849-61. Taylor K et al. (2015) Nanocell targeting using engineered bispecific antibodies. Elders, R.C. et al. (2014) Recombinant canine IgE Fc and an IgE Fc-TRAIL fusion protein bind to neoplastic canine mast cells. Vet Immunol Immunopathol. 159 (1-2): 29-40. Sharkey, A.M. et al. (2015) Tissue-Specific Education of Decidual NK Cells. J Immunol. 195 (7): 3026-32. McGough, I.J. et al. (2014) Identification of molecular heterogeneity in SNX27-retromer-mediated endosome-to-plasma-membrane recycling. J Cell Sci. 127 (Pt 22): 4940-53. Gohlke, S. et al. (2017) In Vitro and In Vivo Studies on the Structural Organization of Chs3 from Saccharomyces cerevisiae. Int J Mol Sci. 18 (4): pii: E702. Nesbit, C. et al. (1999) MYC oncogenes and human neoplastic disease.